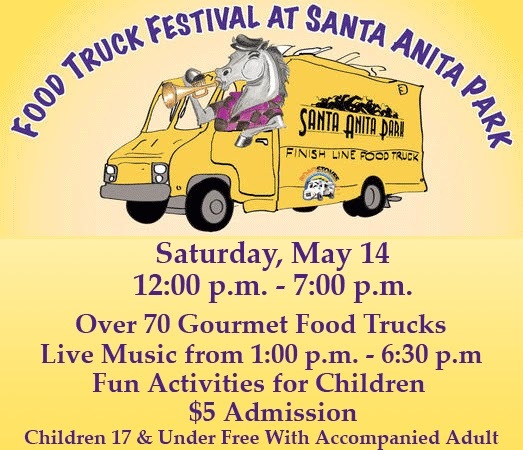 The Santa Anita Food Truck Festival is back by popular demand! Enjoy gourmet food from 70 of Southern California’s finest gourmet food trucks including The Grilled Cheese Truck, Lobsta Truck & Nom Nom Truck. Food trucks and foodies everywhere will take over the ENTIRE Santa Anita Infield. The event will be held in the vast Santa Anita Park Infield, in the middle of the race track. The event will take place from 12:00 p.m. to 7:00 p.m.
Live music from 1:00 p.m. to 6:30 p.m.
For kids, we have Family Fun Day, consisting of moonbounces, pony rides, face painting, playground and carnival games. Moonbounces and playground are FREE. Pony rides, face painting and carnival game tickets can be purchased at the Family Fun area. General admission to Santa Anita Park is $5. With general admission, entrance to the Food Truck Festival is free. Children 17 and under are free, when accompanied by an adult. Santa Anita Park general parking is $4. Parking will be located at Gate 6, off of Colorado Pl.